Chasing brightly colored feathers dangling from the end of a stick, Blue and Skye leap in the air, their paws making tiny thuds as they land on the tile floor. At 5 months old, the Siamese kittens exude health and happiness. “They have really taken to living with us and have become part of our family,” beams Anto DeVargas. Now exhibiting typical childhood energy, Blue and Skye were runts of a litter dropped off in a cardboard box at Palm Springs Animal Shelter. The two brothers arrived seriously malnourished. “The shelter staff had to feed them by placing food at the ends of their fingers, hoping they would lick it. They were really worried the kittens weren’t going to make it,” explains their other owner, Susan McCabe. Michael Martinez, also was getting over the loss of a pet when he happened upon an adoption program at a local PetSmart store. He was there shopping with a friend when a wire-haired, mixed-breed terrier grabbed his attention. 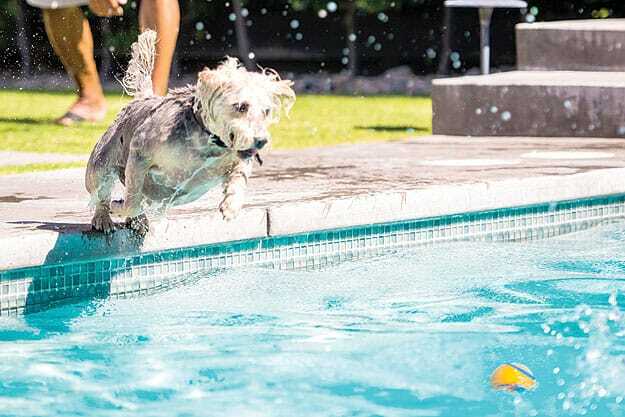 Since then, Eddie has spent many afternoons swimming after tennis balls in the pool at Martinez’s Palm Springs house. The Coachella Valley plays host to more than a dozen animal shelters and rescue programs, including the $8 million Palm Springs Animal Shelter that opened in October. The sheer volume of rescue animals far outstrips even the capacity of this 19,000-square-foot facility. “Our adoptions are up more than threefold from last year,” says Stephen Boyd, vice president of Friends of the Palm Springs Animal Shelter. “But this facility was built to house around 230 animals; and in less than a year upon opening, we are already housing more than 400 animals here.” To encourage more adoptions, the shelter lowered its adoption fee this summer to $20 (a fee that includes vaccinations, microchipping, and a consultation on training and caring for a rescue animal). Tom Snyder, director of marketing at Animal Samaritans in Thousand Palms, says that even with about 200 volunteers, there’s a real need for foster parents for weaning kittens and puppies. “Often, an adoptable dog or cat is slated to be put down in one day and the soonest our pet rescue partners can take the animal is one week. In cases such as this, we enlist a pet foster parent to essentially buy time for the animal until space at a rescue shelter opens up.” Weaning animals are particularly vulnerable to euthanasia at shelters, as they require around-the-clock bottle feeding — a cost in labor and pet formula most shelters can’t afford. The public brings in animals found abandoned in parking lots or public parks or because of home foreclosures or the death of a senior. Being thrust into a foreign environment can be nothing less than traumatic for animals. But that doesn’t mean they are “problem” pets. The socialization and care taken by the animal shelter helped make Eddie an ideal adoptee. “He was housebroken, obedient, and good-hearted. And I don’t think that all came from his last owner, who I was told was quite dismissive of him,” Martinez says. 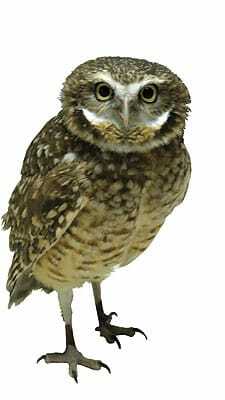 The soulful hoot of a burrowing owl greets me as I walk into the Coachella Valley Wild Bird Center in Indio. A red-tailed hawk peers out from a large enclosure. In another cage, a barn owl puffs his chest with feathery bravado. Nearby, an injured raven tentatively hops in her cage. I carry a shoebox punched with holes. Inside sits a young mourning dove too young to fly, which I found abandoned and vulnerable under a tangle of bougainvillea. Executive Director Linda York dashes about answering phone calls. “I’ll be with you in second,” she assures. “OK, what do we have here?” York soon asks, taking the box from my hands. The burrowing owl (the center’s ambassador, Gabby) flies from his perch and lands on the back of a chair. York weighs the dove and comments favorably on its condition. She sets the empty shoebox next to a stack of other aerated boxes that once contained orphaned or injured birds brought to the nonprofit bird rehabilitation center by people, like me, who cannot turn a blind eye to a creature in need. For more information on Coachella ValleyWild Bird Center or to volunteer, visit www.coachellavalleywildbirdcenter.org or call 760-347-2647. Eddie likes to dive in for a swim. Anto DeVargas and Susan McCabe have added sibling Siamese kittens, Blue and Skye, to their family.